MORE than 150 people attended yesterday's 'Driving Growth in the North West' seminar which was convened in Burt in response to the "challenges and opportunities of Brexit". One of the speakers, former ESRI director Dr Frances Ruane, said she was "impressed by what the North West region is doing and how well it is set up". "All macro economics is ultimately micro and the North West region should do all they can at this point in time to realise their vision for the North West City region, irrespective of Brexit," she added. Members of the audience who attended the Brexit-focused 'Driving Growth in the North West' seminar in Burt on December 6, 2016. 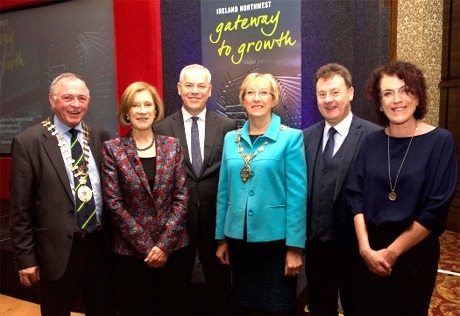 Chief executives at Donegal County Council and Derry City and Strabane District Council outlined "new and innovative working arrangements" that allowed both local authorities collaborate and engage with central government on both sides of the border. The conference also heard from Dr Katy Hayward of Queen’s University Belfast on the impact of Brexit on the free movement of people across the border and made a number of suggestions of innovative arrangements and solutions that could be considered for this region. Among attendees at the 'Driving Growth in the North West' conference were, from left, Cllr. Terence Slowey, cathaoirleach Donegal County Council; Dr. Frances Ruane, associate professor, Trinity College Dublin; John Kelpie, chief executive, Derry City & Strabane District Council; Mayor of Derry Alderman Hilary McClintock; Seamus Neely, chief executive, Donegal County Council and Loretta McNicholas, research and policy manager, Donegal County Council. 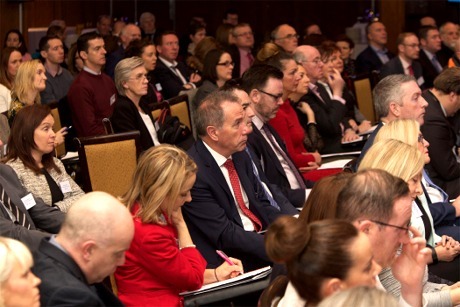 Donegal County Council chief executive Seamus Neely said the seminar, which was held at An Grianan Hotel, was "only the beginning of the conversation". “Today's speakers have provided us with food for thought that will help us continue to develop our views and thoughts that will allow us to develop a collective response to the challenges and opportunities presented by Brexit for this region," he said.